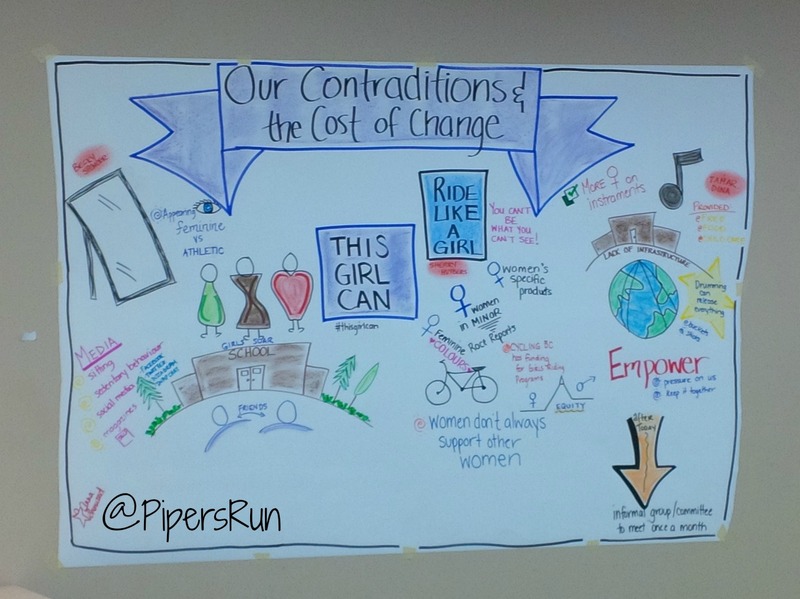 Graphic Facilitation: It’s Not The Girls, It’s The Culture! First off, yesterday was a run day for me but I did run. I spent 7 hours on my feet minus the few minutes I took to sit and eat my lunch. I’m not complaining at all…it was a GREAT day! Normally, I would run even after an exhausting day at work but with my hamstring injury, I’m taking things easy when I can. It’s party of my recovery plan so I can get back to half marathon training and THEN…train for my first FULL. (It’s still on my list). I started off the day with a 1.5 hour drive that should have been 35-40 minutes tops because we had a little dump of snow and that made everything come to a halt in Halifax. Little did I know, getting to and from the workshop would be my most stressful part of the day – not the graphic facilitation. I received a text from my husband wishing me good luck and to have fun drawing etc. You know, sometimes it’s those little things that make you feel really good. That was one of them and it help start my day off just right. Melissa and I started cutting the paper and prepping our work area right away as we had very little time due to arrive later than expected. 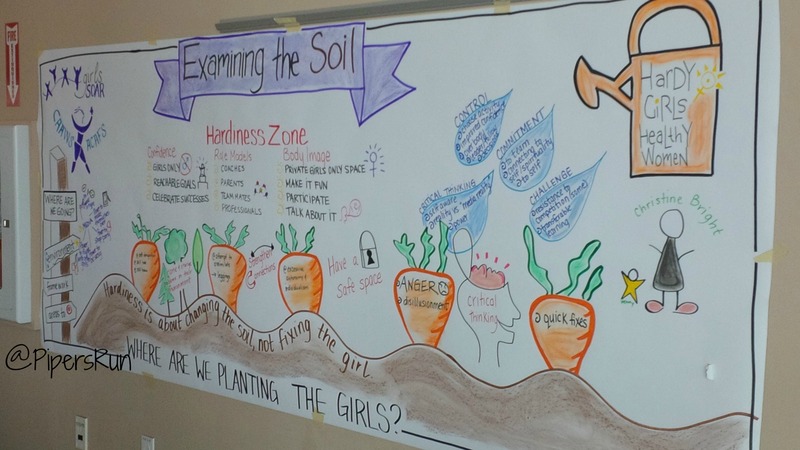 Examining the Soil – Where are we Planting the Girls ? Over lunch we tried to start the resource graphic but failed to finished it until the end of the day when everyone had left. We couldn’t leave it unfinished. 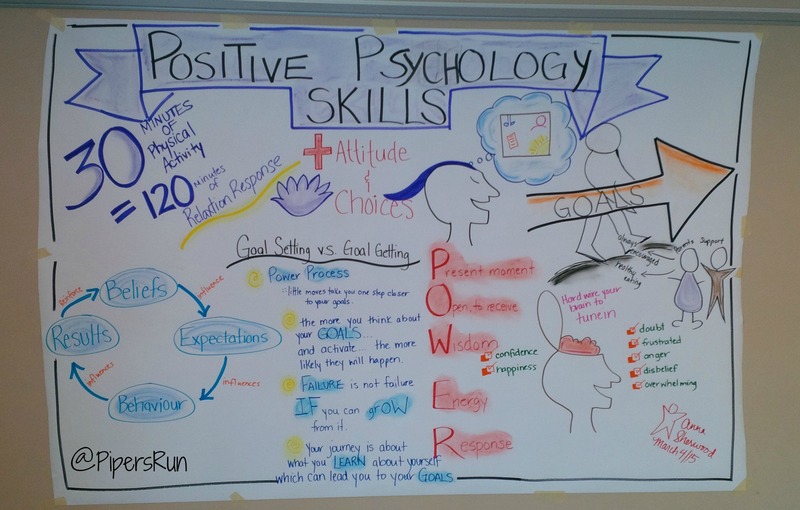 Positive Psychology Skills – where I spelled “Psychology” wrong THREE times! Can you say nervous?!? In the end, I got it right. Then, I went upstairs to a smaller room and did “Our Contradictions and the Cost of Change”. There were three presenters. Overall, it was an amazing day! We had so many complements and some people though we were actual artists! We corrected them right away to say that we are not artists but took a course. We even had a few people ask if we could come do the same thing for their work! Lots of complements and a big confidence booster. We met, Stacy Chestnut, race director for Sole Sisters that support a program called Girls Gone Gazelle. She was lots of fun and gave us her business card….don’t worry, I’ll follow-up Stacy. We met many recreation programmers that work with girls only groups. I really I wish I had more time to speak with them as they were all so interesting and I wanted to connect with them on the work they were doing and see what I could bring back to my region. Was really proud of the women I work with and that are all over Nova Scotia doing great things for girls and women to be active. I think I could go on and on about yesterday’s experience. I wish I could have taped all the presentations so I could run their words through my head again. When was the last time you stepped out of your comfort zone? How did you feel? 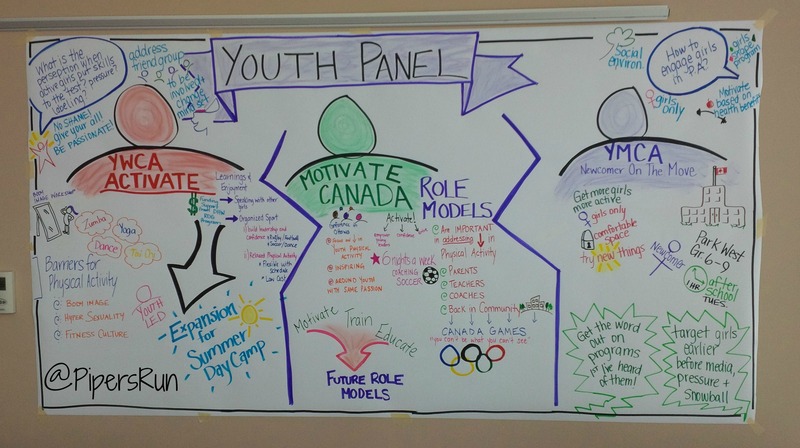 What do you do in your community to empower young girls and women to be active? I dare you to step outside your comfort zone this month and tell me about it. Don’t forget about the Manitoba Hemp Hearts Giveaway!!! Anna, so glad it went well and I am happy that you shared it here. What an interesting and exciting way to capture and share the subject matter. Will you share your drawings with the attendeeds now, somehow? Taking pics and making handouts or emailing? These are too good to just let go of! Yes, they will take photo’s of the designs and have them printed and sent electronically to all the participants! Lots of people took pictures or came over and wrote stuff down. WOW! Impressive work, congrats! Great art skills and great topics. Love it. Thanks. It gave us a nice confidence boost that’s for sure. Wow, awesome graphics! You did a great job and it looks like fun 🙂 What a great conference. That is AWESOME! 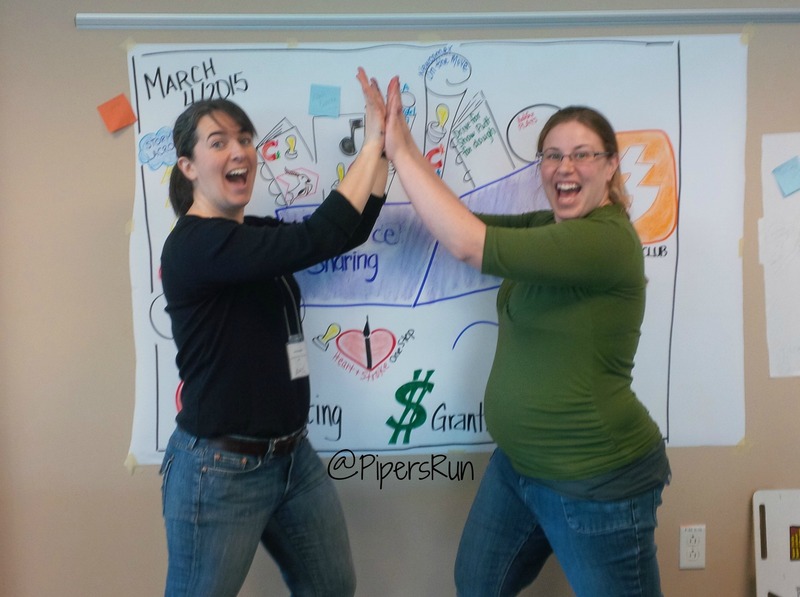 I coach girls on the run, which is an empowerment program (with running) for 3rd-5th graders. programs like that are so, so cool.